Provide comfort for the family of James Messer with a meaningful gesture of sympathy. James "Jim" Victor Messer, 81, a resident of Houston, TX and native of ​Zachary​, LA, died on Tuesday, February 12, 2019. Visitation will be on Sunday, February 24, 2019 at Charlet Funeral Home, Inc., 4230 High Street, Zachary from 2:00 pm until service time at 4:00 pm conducted by Dr. Wayne Barnes. A 1:30 pm graveside service is Monday, February 25, 2019 at Louisiana National Cemetery, 303 W. Mt. Pleasant Rd., Zachary. Jim is survived by his sisters, Elizabeth M. Nichols and Marilyn M. McKowen and husband John​ny​, special friends, Duane, Lou, Arlene and Evelyn and numerous nieces, nephews and extended family. He was preceded in death by his parents, Blanford and Lila Spurlock Messer, sister, Martha M. Boagni, brothers, Burnett Messer and Johnny F. Messer and grandparents, J.W. and Martha Spurlock and Francis and Gladys Messer. Jim graduated from Zachary High ​S​chool and attended Louisiana Tech University in Ruston and proudly served in the US Air Force. Special thanks to Benito Ponce for his years of friendship and care. Please make memorial donations to St. Jude Childre​n's Hospital at www.stjude.org​. 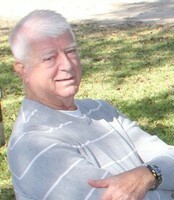 To send flowers to the family of James Victor "Jim" Messer, please visit https://charlet-funeral-home-inc-zachary-la.tributecenterstore.com/?oId=4172437. To send flowers in memory of James Victor Messer, please visit our Heartfelt Sympathies Store. Provide comfort for the family of James Victor Messer by sending flowers.